We also make small and large raised bed planters and chopsticks benches, with or without backs, that can be treated in our Willow green weather durable coat. We can even make trellis fencing to go around areas such as business grounds which co-inside perfectly with the horseshoe planters. These products are ideal for home gardens or even on business grounds. Chopsticks have a chipping plant installed at the workshop. This plant is used to produce biomass woodchip fuel made from clean waste timber that isn’t suitable for the production of our kindling. The fuel has an extremely low moisture content making it a high quality product. The biomass fuel is available for purchase and we are able to arrange delivery in bulk loads or in builder bags upon request! The price of biomass woodchip fuel varies according to supply and demand but if you are interested or have any queries or questions then do not fail to contact us. Lucky Horseshoe planters are a premium grade product made by our members here at Chopsticks. They add a touch of class to any garden! 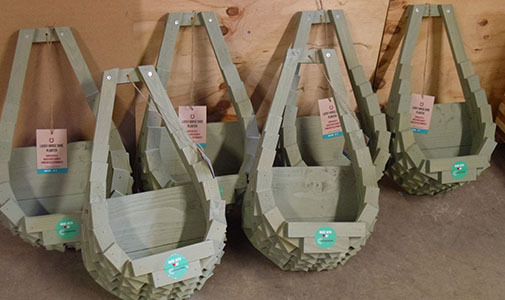 They are a beautiful creation made from wood, treated in an attractive shade of Willow green, with a fibre lining that retains moisture and securely holds compost and plants. That’s not all! As a project suggested to us, we recently made a defibrillator cabinet to go in Tesco Northallerton for the Community First Responders. We are also in the process of creating a fold-up bar for the Wensleydale Railway too. Chopsticks considers no job too big or small and are always open to trying to make new creations! 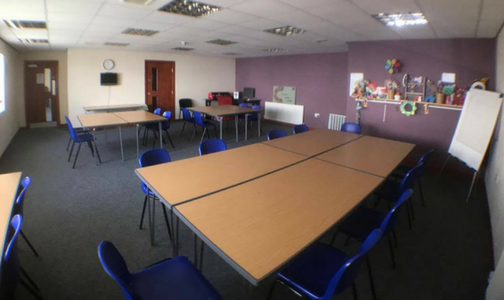 We have two rooms available upstairs that we hire out to businesses or small organisations to use for meetings or training purposes. Our small room can facilitate up to 12 people and our large room can fit up to 25. We organise the room to any layout upon request and we also have toilet and kitchen facilities upstairs. For an additional fee we can provide you with a lunch, as well as tea and coffee. If you would like to book any of our rooms then give us a call on 01609 761661 or email us on jan@chopsticks.org.uk. Chopsticks does exactly as it says in the name. We chop sticks! Our main activity here is the production of premium grade kindling with biomass woodchip fuel made from timber which would have otherwise been sent to landfill. 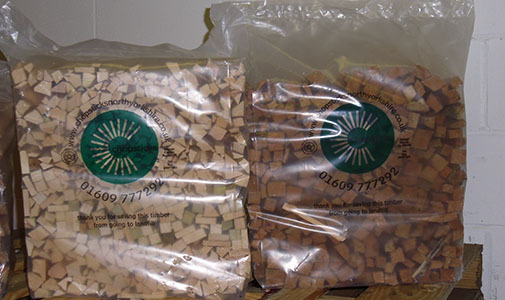 Our members chop, sort and pack our timber which is then sold to YOU so each bag you buy goes towards the growth and development of our members and our charity! We are proud to be BSL authorised meaning that we do our bit for the environment too! 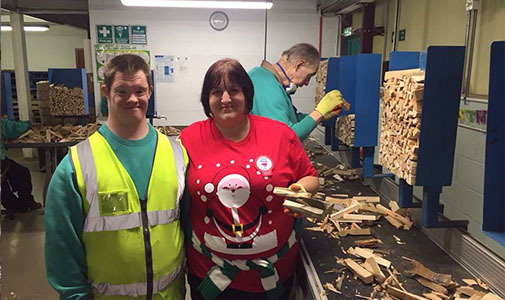 In 1995 a group of resourceful members with learning disabilities started to chop firewood from scrap timber under the name ‘Chopsticks’. Thus creating who we are today! Need a hedge cutting? Need a lawn mowing? Then we can help! Here at Chopsticks we also offer a Garden Care Maintenance programme which includes small, regular garden maintenance tasks that our members undertake for the general public. This is a great opportunity for the general public to meet our members and find out more about us! We maintain gardens in the local area covering places such as Northallerton, Leeming Bar and Bedale. We charge a competitive rate of £17 for a small garden and £25 an hour for a large garden. The cost of the job is determined by our Garden Care Maintenance Supervisor, Caroline Whitehead, who works with our lovely members in completing the garden tasks! At Chopsticks we like to provide our members with as many opportunities and activities as possible. Our staff runs ChopArts, a Thursday crafts class for both our Members and private clients where they can be creative and form great friendships! We have also recently introduced a glass crafts class which gives our Members and clients the opportunity to create personal bespoke glassware such as cooker splashbacks, placemats and worktop savers. Chopsticks also provide a community outreach scheme in which we offer community based services that aim to fulfil the individual needs of our customers. We are on the North Yorkshire County Council’s approved list of non-regulated service providers. 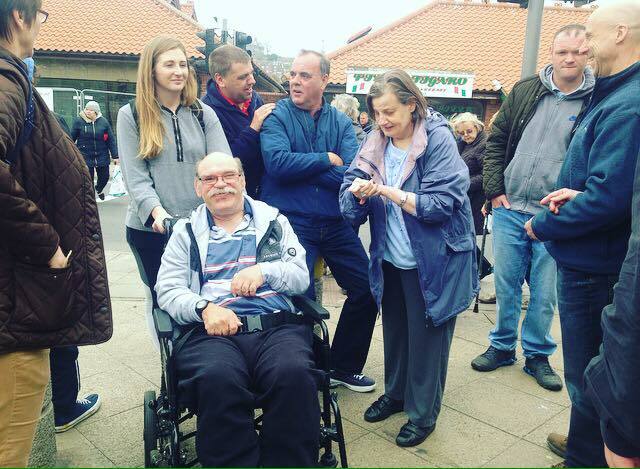 Our service is available to anyone with a disability or older people in need of support to maintain independence and a quality lifestyle. We can help assist with things such as shopping, paying bills, support for social activities, getting to and keeping appointments and much more! Ask and we will do our best to meet your needs or the needs of those you care for.